& y-intercept for any given equation of line. y-intercept of c units is given by y = mx + c.
If the equation of the given line is a x + by + d = 0. 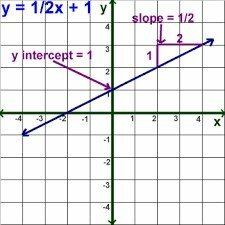 Find the slope & y-intercept of the line x+y=7.Here, we can rewrite the equation as y = – x + 7 = (-1)x + 7.Hence here slope m = (-1) & y-intercept, c = 7. Find the slope & y-intercept of the line 4x + 2y = 8.Here, we can rewrite the equation as 2y = – 4x + 8 = (-4)x + 8.or y = (-2)x + 4.Hence here slope m = (-2) & y-intercept, c = 4. 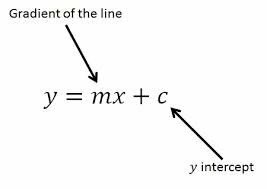 Here, we can rewrite the equation as y = (0)x + 0.Hence here slope, m = 0 & y-intercept, c = 0.Find the slope & y-intercept of the line y = 0. Find the slope & y intercept of the line x + y – 75 = 8. Find the slope & y intercept of the line 3x – 7y + 105 =0. Find the slope & y intercept of the line 10x + 2y =26. 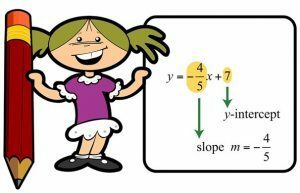 Find the slope & y intercept of the line 15x – 3y + 75 = 0. Find the slope & y intercept of the line 24x + 8y =96. Slope m = (-1), y-intercept = 83. Slope m = (-5), y-intercept =13. Slope m = 5, y-intercept =25. Slope m = (-3), y-intercept = 12.